Created for all kinds of fabrics, even the most delicate. 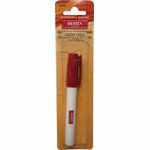 This temporary glue stick allows you to position your templates, embroidery motifs, hems and appliques before sewing. The penstyle design makes application quck and easy, while the pink color lets you see exactly where it has been placed but it disappears when drying 8". 1 glue pen per package, 5 packages per box.